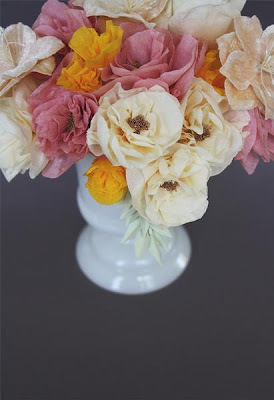 Crepe paper rolls are $1 for 4 at my local dollar store — and now you can turn them into a lovely bouquet. Tutorial on Blush & Bashful. I saw these over on Whimsical Kitty, and thought I must pass it on to you — Totoros! Made of socks! I’m sooo going to make the tiny white one! Totorial by BanDitte on Cut Out & Keep. I once took a puppetry / mask‐making class and made a mask with bristol boards, kind of like these. But these are more 3‐dimensional and much more awesome than the one I made! I made a Jade Rabbit mask (because we used the mask for storytelling in the class) and I had to throw it out after a year because it was falling apart and collecting dust. It would be cool to remake my Jade Rabbit mask with the template from this very cool tutorial! Tutorial by Ricebabies on WhipUp. 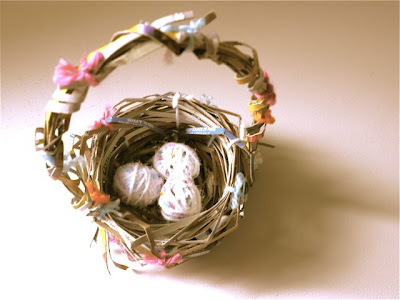 I’d like to take this basket on my Easter egg hunt. It’s like a nest with a handle. I’m going to have to bring Chuck & Robin in it. And guess what? It’s made from a cereal box and yarn bits! That’s super awesome because I can so easily find both in my house :D Wouldn’t this also make a lovely gift basket? Or bed for a stuffed animal? It’s a basket with endless possibilities! How‐to on Michele Made Me. I love eggs. But I love cake eggs more. And here’s the doughnut from Mochimochi Land! I don’t know if I have the knitting skills to make it but I’m determined! 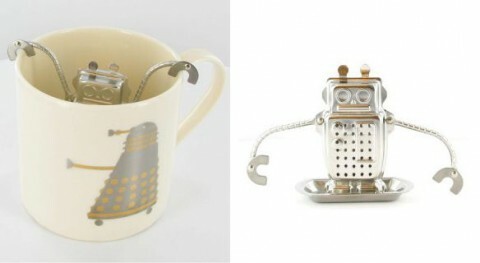 As if the tiny things are not cute enough, check out this tea robot. That’s all for now! More favourite things and crafty inspirations to come next Friday! Have a happy weekend, everyone! make a rainbow cake slice!